Appleton artist Elyse-Krista Mische begins work on the mural that will be completed April 29, 2017 during Bazaar After Dark. Photo by Tony Penterman. KAUKAUNA — Downtown Kaukauna is putting the finishing touches on downtown for Saturday’s Bazaar After Dark festival. A program of Pulse Young Professionals Network, will kick off the season April 29, 2017 in Kaukauna. — The festival will run from 5 p.m. to 10 p.m. on Second and Third streets. — Parking will be scarce. 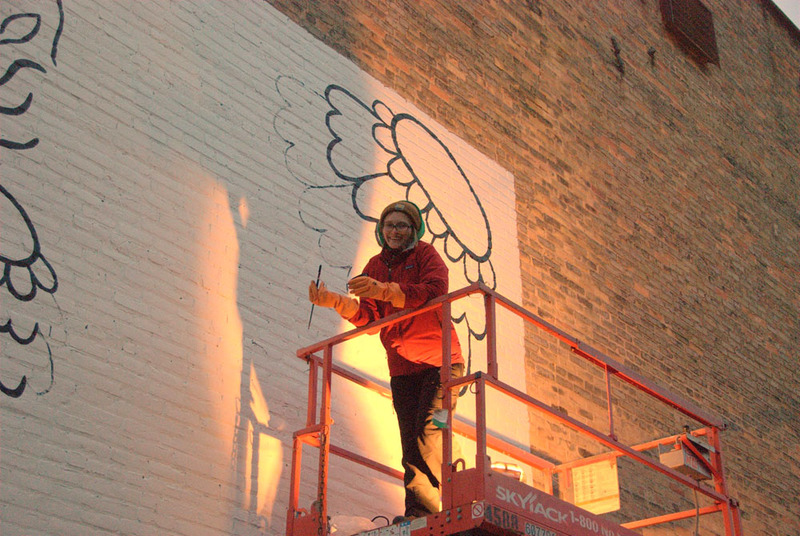 — The weather should begin dry, about 50 degrees, but sprinkles could start about 8 p.m.
— Among the highlights is a public mural that will be created during the evening on the side of the Carrot Project Building at 139 E. Second St., according to Carissa Holtz. 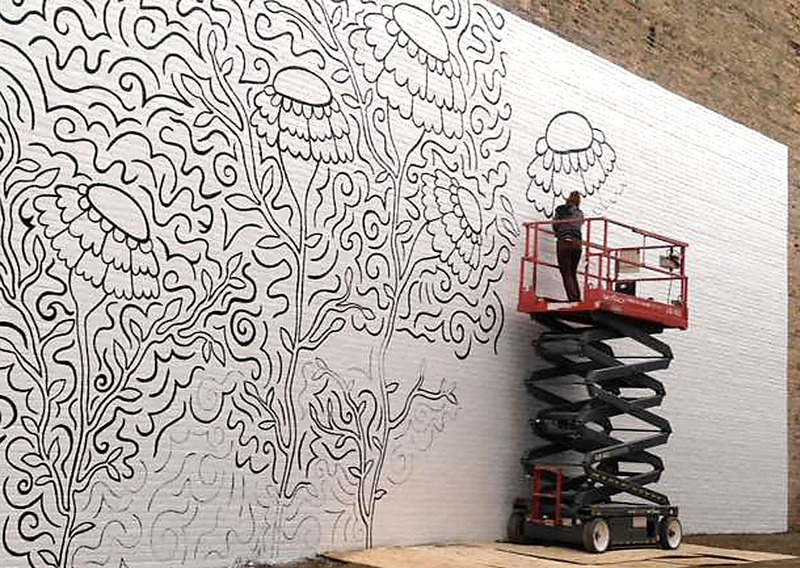 Appleton artist Elyse-Krista Mische is creating the mural. — There will be a high school art window display and work by other artists as well. — For more on the festival, the Post-Crescent had a nice article HERE. — A partial list of vendors is below. The festival is part of the group’s mission dedicated to helping revitalize and draw positive attention to underutilized business districts in the Fox Valley, according to the group’s website. Festival organizers are planning live music and art, art vendors, food trucks, family activities and a few other quirky surprises. 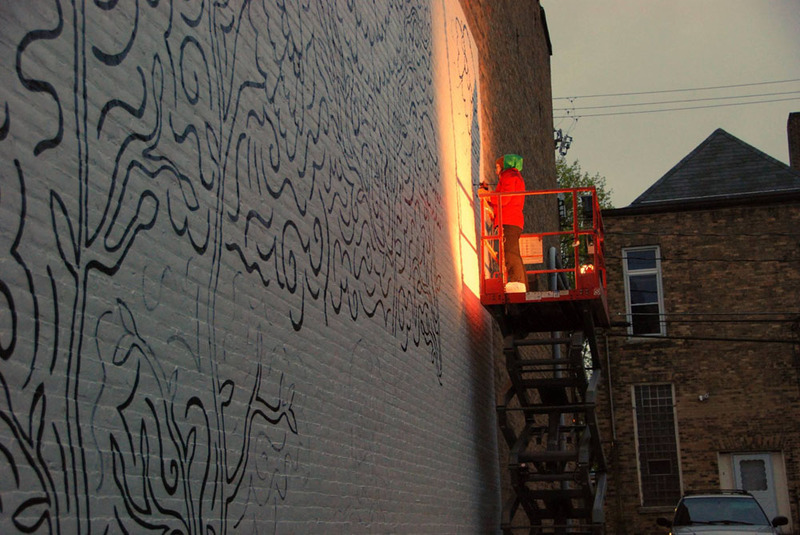 The goal is to complete a ‘live’ public mural for an outdoor environment that reflects the spirit of downtown Kaukauna. Preparatory work is being done in advance, but finishing work will be done during the market as a live piece of performance art. Appleton artist Elyse-Krista Mische working on the mural that will be completed April 29, 2017 during Bazaar After Dark. Photo by Cherie Mytas. • Lori Palmeri from Rehabit Makerspace with her incredible leather and textile furniture and accessories. • aDora Chiapas will be on hand selling incredible handmade amber & seed jewelry and accessories inspired by the traditions and colors of Chiapas, MX. • Funcan C Flowersyou make stunning decorative flowers out of tin cans. • Kaukauna Coffee & Tea (kc&t) pour a little bit of heart and soul into every cup. The event wraps up about 10 p.m. with the launch of hundreds of paper lanterns from the footbridge on Main (just behind Second Street) weather permitting. So bring a lighter and a wish. See last year’s event at River+Bay.com.